The good people of Acer were kind enough to give Darryn and me the Acer Aspire S7 Ultrabooks to use during our recent trip to E3. Everyone who encountered them got that shiny, jealous look in their eyes – these Ultrabooks are fantastic gadgets, but this level of awesome doesn’t come cheap. So, let’s look at what’s on offer. To say the S7 is pretty is quite an understatement. 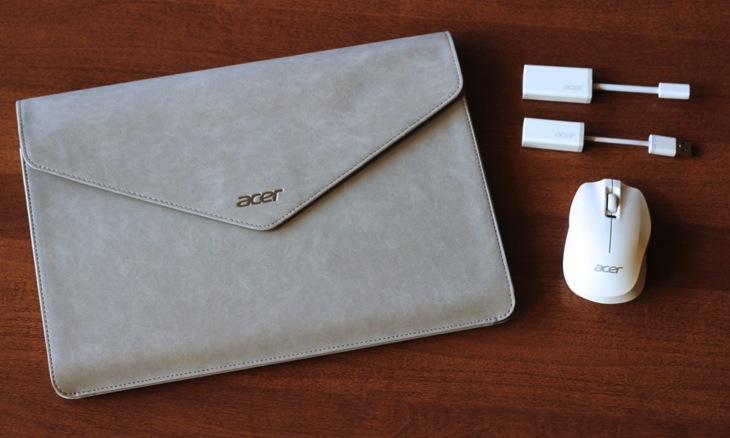 To begin, the Ultrabook is ridiculously thin and light – Darryn actually compared his iPad 4 (with case) to the Acer when determining what to pack for a day on the show floor. The Acer was lighter. That’s right, this little beauty is lighter than the iPad, weighing in at just 1.3 kilos (2.87 pounds). It’s only about 13 mm thick (half an inch), helping it to fit perfectly in my handbag, even with its protective case. Sure, it’s thin and light, but the true aesthetic and joy of use come when you open it up. 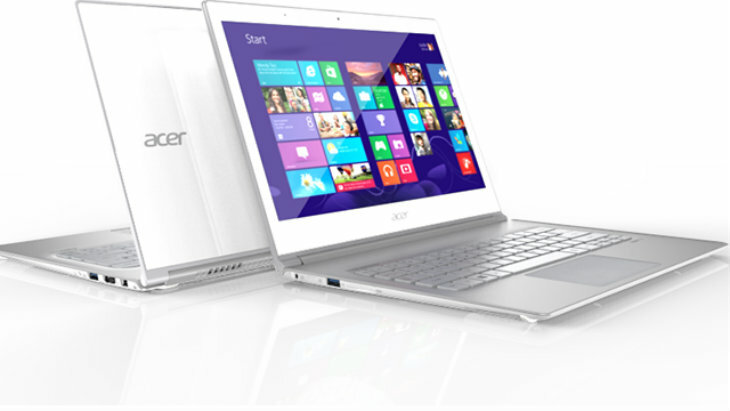 Using the power of Windows 8, the S7 combines touch screen integration with normal laptop use. There’s a trackpad and keyboard, as well as a wireless mouse that comes standard in the box. This was a big selling point for me – I’m not generally a fan of Windows 8 on PCs as I find it much easier to use on touch devices. Here, the Ultrabook is able to make use of that ease of design with touch, while still offering all the interfaces necessary to do real work. Thanks to some impressive specs (see below) the S7 boasts a ridiculously quick start up speed, as well as the ability to work fluidly between applications without any delay. Unlike other laptops that are typically underpowered, the Aspire has enough power under the hood to offer real life workability. Adding to that, the machine has an excellent battery life. On power saver, you could probably squeeze about 8 hours from the machine; on full blast (the way Darryn and I like to work), we managed to get 4-5 hours of work done before needing to plug in. This made it ideal for working at a convention, and makes it worthwhile to take along during business trips of all types. 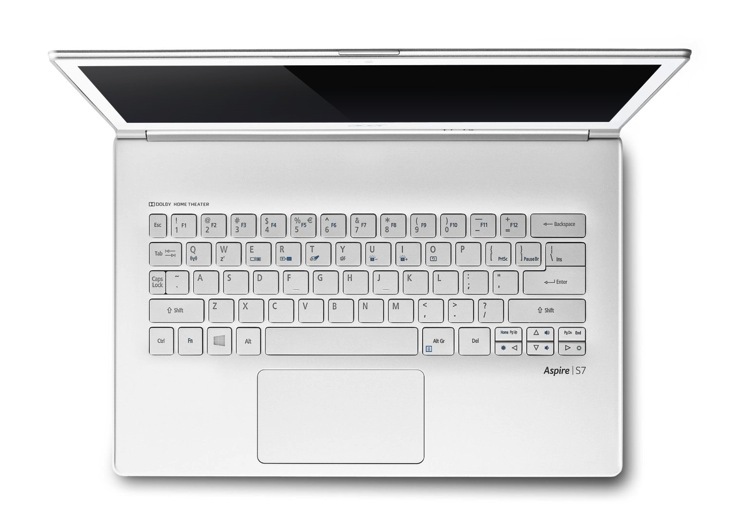 Perhaps our only gripe with the Ultrabook was with the keyboard layout. While the keys are excellent and the tactile feedback is great for a laptop, there were some odd placements of keys. Lacking a dedicated row for F1-F12 keys, the controls for multimedia playback, screen brightness and volume control are spread around in ways you might not be familiar with. Additionally, the movement of the accent/tilde key next to the caps lock key made Darryn ridiculously frustrated – instead of complaining about aching feet I’d hear him ranting about missing the caps lock key. Of course, as with any new keyboard layout, once you get used to it, it is perfectly serviceable. The S7 comes with a 4th generation Intel Core i7 processor as well as 8GB of RAM. Yes, this thin little beast packs quite a punch. Thanks to two 64GB SSDs linked together with RAID, users get 128GB of rapidly accessible space. Sure, 128 GB might not seem like that much, but for an Ultrabook that is presumably used for work, it’s more than you’ll probably need. Of course, if you want to watch loads of media content, you might want to linked up an external hard drive. That said, despite doing tons of photo and video content during E3, Darryn and I never felt tight on space using these Aspires. 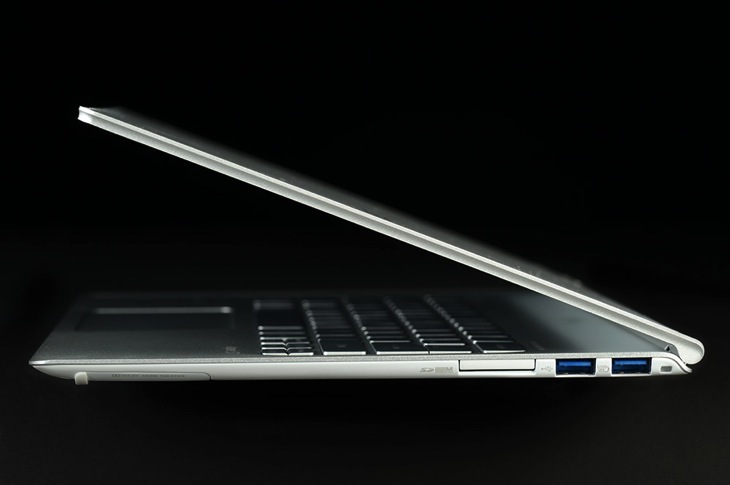 The Ultrabook comes pre-loaded with almost nothing – not wasting any of that precious storage space. Opening up the Ultrabook, you’ll find Windows 8 and… Skype. Everything else needs to be added on. However, I love the idea of a computer that doesn’t come pre-loaded with bloatware. Let me pick and choose how I fill up the machine, getting exactly the applications (and versions) that I prefer. None of us at Lazygamer wanted to see those Aspire S7s go. The Ultrabook is a stunning display of tech, seamlessly bridging the divide between nifty gadget and workhorse PC. Of course, the only real downside is the price, coming in at about R25k. If you can afford it and need a travel-worthy work PC, we’d highly recommend it. Just remember, it won’t be able to play Crysis.